Green sea turtle or honu, one of the endangered species in Hawaii. There are many endangered species in Hawaii. A few years ago, the American Bird Conservancy declared Hawaii as the most threatened bird habitat in the United States. Over ten species of birds have gone extinct in the last 30 years alone in the State. Hawaii’s endangered species include over 30 types of birds. The state comprises less than 0.2% of American soil. But nearly one quarter of the nation’s endangered species of animals, birds and marine mammals are in Hawaii. This makes Hawaii the endangered species capital of the world. If not properly protected and cared for, these birds could easily vanish from the face of the earth. Several of Hawaii’s endangered species with the gravest danger of extinction can only be found here. This includes the Oahu tree snail, the Hawaiian nene goose and the Hawaiian hoary bat. The goal with endangered species is to protect their natural habits and the resources they need to survive. 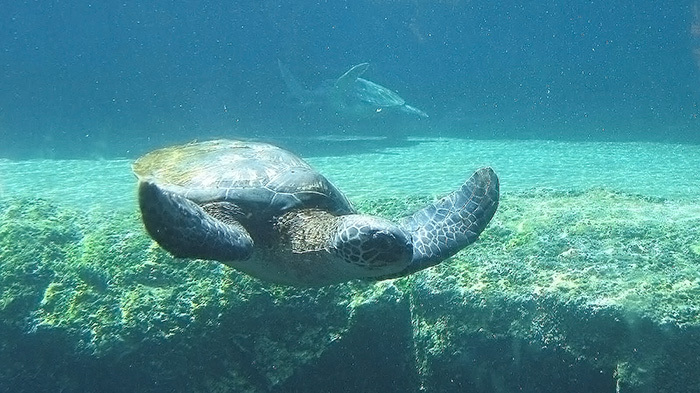 The green sea turtle or honu is an endangered species in Hawaii largely because of human interaction. They often die from pollution or from loss of habitat. Additionally, they are susceptible to diseases and to stress from human interactions. While it’s illegal to capture or kill honu, even disturbing, approaching or touching them is dangerous to the animal. Violators can be subject to serious fines and even imprisonment. Scientists once considered it a subspecies of the hoary bat found on the mainland US. But now they’ve determined they Hawaiian hoary bat to be unique to the State. And it is among the endangered species in Hawaii. The species descended from a pair of bats that migrated thousands of miles from the Americas. They typically are 10 to 13 inches in size. Although they once inhabited all islands, they no longer exist on Oahu at all, due to habitat loss and pesticides. This raptor is endemic to the state of Hawaii. While now only seen on the Big Island, scientists have found fossils of these creatures on Kauai, Oahu and Molokai. The Hawaiian hawk or io can reach up to 18 inches tall. And some consider them an amakua or family god. The Hawaiian hawk’s existence is threatened by declining forest areas, illegal hunting, starvation and predation. The Hawaiian monk seal is the only seal native to Hawaii. It is one of two monk seal species in existence worldwide. 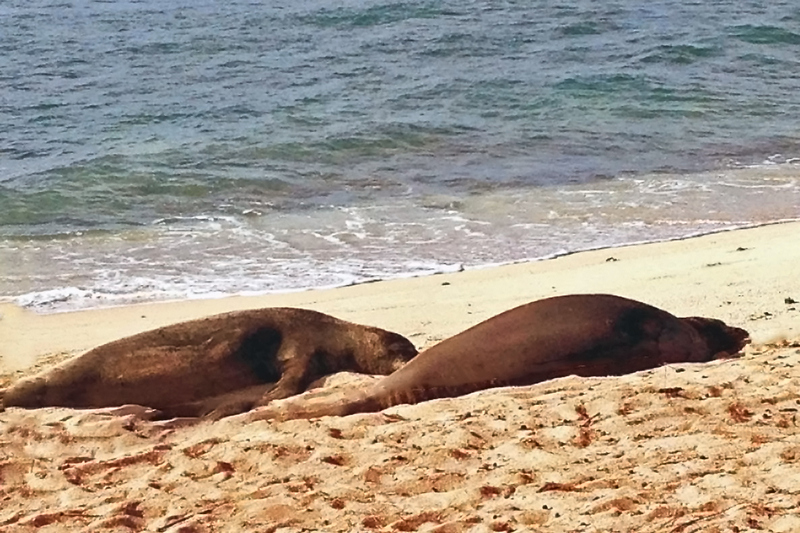 There are less than 1,000 Hawaiian monk seals left on the islands. Hawaiians called the State mammal of Hawaii ilio-holo-i-ka-uaua meaning dog that runs in rough water. Threats to these creatures are high infant mortality, insufficient food, shark attacks and stress from human encroachment. Hawaiian monk seals. Photo courtesy of Marcus Chang. These large birds make their home on the summit of Haleakala on Maui. Hawaiians call the crested honeycreeper akohekohe. The Endangered Species Act now protects the bird. Their numbers have dropped drastically in the last few decades, leaving only an estimated 3,800 birds. 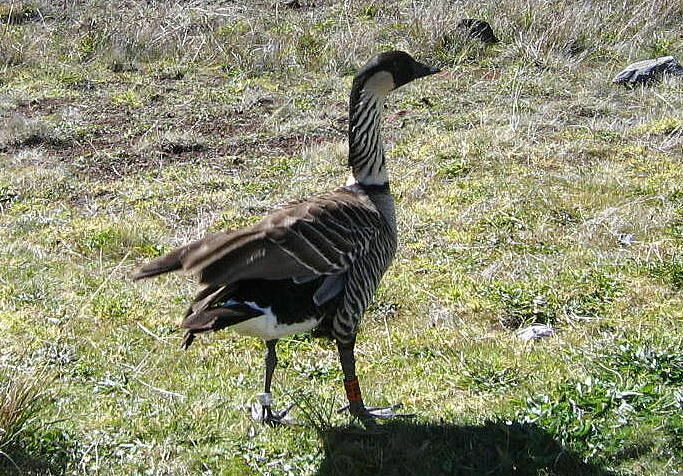 Of all the native Hawaiian animals, the nene goose experienced the closest brushes with extinction. Hunters almost killed them off completely in the 1940s because of lax laws. Fortunately, the geese became the Hawaiian State Bird in 1957. As a result, this gave the species greater protection. As a result, there are now small populations on the Big Island, Maui and Kauai. However, because of predation issues, there are still only about about 800 nene geese in Hawaii. The Oahu Tree snail is a part of the Achatinidae family. They are bright tropical snails that usually live on one tree all their lives. Although there are 41 tree snail species endemic to Oahu, there are only about a 100 of each in existence. Predation by rats and chameleons, loss of habitat and human encroachment are threats to this species.